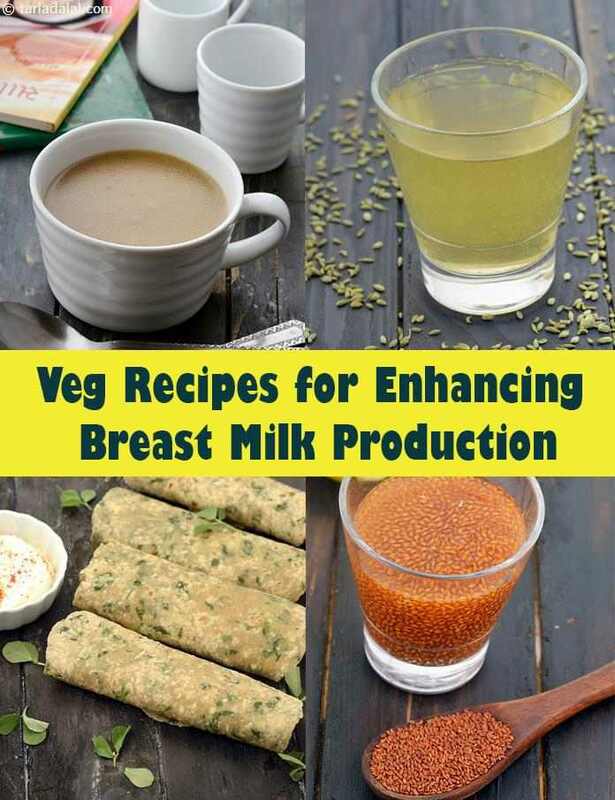 Recipes for Enhancing Breast Milk Production, Indian Veg Recipes. What a lovely journey is motherhood! From the time you learn you are pregnant to finally holding your little bundle of joy in your arms, the joys and ups and downs and worries all make it a memorable time. Of course, the postpartum period is a difficult time – though you are out of your pregnant state, your body is still sore from the whole process of pregnancy and delivery. Additionally, the newborn has to be nursed and cared for. You are just about getting used to BREAST FEEDING. Adequate nutrition is essential all along, and cannot be compromised at any time. You know that the first milk, called colostrum, is the building block of immunity for your baby. And, thereafter breast milk is a source of nutrients and antibodies for your little one. The quality and quantity of breast milk depends very much on the mother’s nutritional backup made during the 9 months of pregnancy and what she eats while breast feeding. While water holds first place in being added to a lactation diet, other foods can also be looked upon. There is no magic potion in any food, but some foods can definitely help in enhancing breast milk production. These are called galactogogues. Though each of these food may not have enough evidence, but they have been passed on from generations and have been found useful by most new moms. Go ahead…I am sure that the post-partum journey will be as pleasant and a growing experience for you. Enjoy our Recipes for Enhancing Breast Milk Production, Indian Veg Recipes and other lactation recipe articles below. Sometimes, simple recipes taste more awesome than the elaborate ones! this is one such example. A very easy recipe combining iron-rich fenugreek leaves and protein-rich green gram dal, the smell of methi moong dal subzi bubbling on the stove will draw your family to the table! The perfect dish to serve for a Holiday lunch. Fenugreek dumplings are deep fried and dunked for a few seconds in milk and then immersed in the curd kadhi. This process of soaking the fenugreek dumplings in milk makes them softer and more succulent and reduces the sharpness of the curd based kadhi. Garlic, green chilli paste and sesame seeds add a distinctive flavour to these otherwise bland rotis. For best results, serve these easy-to-make rotis with a smattering of ghee. This easy-to-make, simple porridge prepared from broken wheat, oats and fruits is rich in fibre and b complex vitamins – ideal to keep the metabolism going and lose pregnancy weight. I’ve used low-fat butter and milk to keep the calories down. Garlic vegetable soup, a delicious soup to begin your meals with or to be had as a mid-morning snack. I’ve flavoured it with garlic and added loads of mixed veggies to create a colourful and nourishing fare. Low-fat milk keeps the calorie content low. A side dish that adds the extra zing to your health! This is a special dish recommended for expecting mothers to fulfill the increased demand for iron. Stuffed to the core with iron health, this khichadi is a treat for elders and the children in the family!